I’ve played Hearthstone on and off for a few years, since it first came out. As I played more and more, I began to notice parallels between my decision making processes in Hearthstone and in real life. This is a self-reflective post, and my first attempt to describe the core features of my mentality and decision making process. Because this has been part of my personality for so long, I found it difficult to put my ideas into words, but here goes. First, it’s a game of imperfect information and chance, so you must take risks and deal with uncertainty. Real life situations are usually like this. Games of perfect information (like chess) lack this probabilistic aspect and behave very differently. 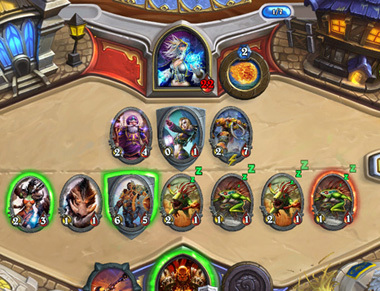 Second, Hearthstone is a game about decision making skills, rather than mechanics. Every game has some element of decision making, but many games require doing some mechanical action (eg. last hitting) better than your opponent. Mechanical skills are confined to the specific game and are less likely to be relevant in real life. 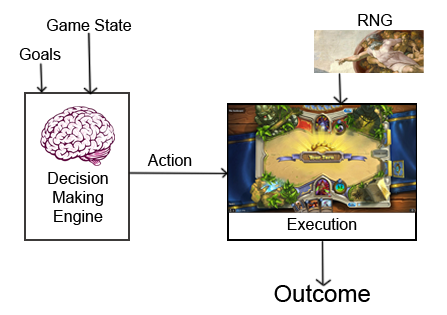 By playing Hearthstone, I developed a general internal model for making decisions in uncertain situations. The goal in Hearthstone is to reduce your opponent’s life to zero. How do you accomplish this? You make a plan, perhaps flooding the board with minions, perhaps unleashing a deadly combination of spells. For our purposes, it doesn’t matter what your strategy is. At the start of the turn, you look at the cards in your hand, the state of the board, what cards your opponent played before. Call this information the game state. You ponder for a bit and come up with an action that best improves your position. You execute your action on the board, but you still don’t know what happens next with certainty. There are many things you cannot control, which I will call RNG. RNG is short for Random Number Generator, and I will use it to mean anything you don’t have control over. I use the term RNG for lack of a better term, but I’m not just talking about random game mechanics. RNG includes any state hidden from you, like your opponent’s hand and strategy. Think of it as a random variable with a known distribution (eg. you play a card that destroys a random minion, which minion will it hit?) or with an unknown distribution (eg. what is the probability your opponent has two flamestrikes in his deck?). Even if the information is known to your opponent, it’s simpler to treat it as a random variable. In any game state, there must be one “correct” action that gives you the highest chance of winning the game. The decision-making player aims to consider all possible actions and choose the best, “correct” one. As a corollary, decision making should be rational and be a function of things I can observe. Otherwise, if my decision engine generates two different actions depending on my emotional state of mind, they cannot both be correct. A second corollary is actions should always be justifiable through fundamental values. It’s unacceptable to do things by habit, or because other people are doing it — everything I do should have a positive expected value on the things I want to accomplish. For me, one of my “meta” goals in life is to make correct decisions as much as possible. This is not to say that I behave like a robot — I still experience emotions like everyone else — but I try to eliminate emotions from my decision making process. 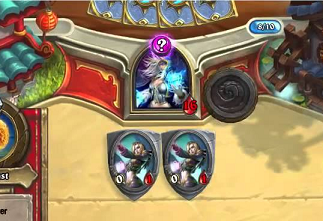 In Hearthstone, doing so gives you the highest chance of winning the game. It makes sense then, by extrapolation, that correct decision making gives you the best shot of getting what you want out of life. One rule of thumb in Hearthstone is “RNG first”. If you are going to play a sequence of cards, one of which has a random effect, it’s better to play the random effect first. This way you extract information out of the RNG pool of unknowns, and with this extra information you might be able to make a better play. You want to play a giant, but you’re worried that the secret is “mirror entity”, which summons a copy of the next minion you play. Without any other information, you’re in a tough spot. But what if you played a minion last turn and the secret did not activate? Then you know that the secret isn’t mirror entity, and confidently play the giant. Alternatively, suppose that you don’t have this information handy. One tactic is you can “test out” the secret by playing a small minion, and seeing whether the secret activates. You are paying a price with a normally inferior move, but the information you obtain is valuable for future decisions. Under this framework, we can view flirting as an example of an information gathering strategy. You’re at a party and you see a cute girl walk by. At first, you make a few playful comments, and observe her reaction and assess if she is interested in you. Flirting isn’t just an arbitrary social custom, but a means to obtain information. While information isn’t the final end-goal by itself, even a little information can greatly improve decision making, by eliminating vast swathes of possibilities that no longer need to be considered. Whether it be playing a giant, making a big purchase, or asking someone out on a date, gathering information is a useful subgoal. Often in Hearthstone, luck is just not on your side. Have you ever seen your opponent topdeck the pyroblast and instantly win the game? Or that mad bomber that hits you three times in the face? How do you feel? It’s natural to feel angry when this happens to you, especially if it ends up losing you the game. But eventually I realized how pointless it was to get upset at unlucky RNG. What’s the use of worrying about things you have no control over? I see this all the time — people getting visibly upset when the bus is late, or when a player on your team goes AFK in a game of league. I try to adopt the opposite mindset: worry about my own decision making and simply accept random events beyond my control. Let me give you an example. Last term, during an important phone interview, my phone stopped working during the middle of the interview. Calmly I got up and notified the CECA front desk, and waited as they spent the next 20 minutes troubleshooting the problem. Most people would be stressed out at this point, but I didn’t feel stressed at all. Rather than getting upset, my mind was relaxed, because I took comfort in knowing that I did everything that could be done; whatever happens next was out of my control. The law of large numbers says that when you repeat a random event many times, the average outcome will surely converge to the expected value. Hearthstone is so random that a legend player will beat a rank 5 player no more than 55% of the time. Any single game is close to a coin flip, just marginally in favor of the stronger player. But over the long run, it’s a mathematical guarantee that the better player will end up on top. In real life and in Hearthstone, you can’t directly tell if a decision was good or not. You only know the outcome, and you can decide if the outcome is good or bad. But the outcome is a function of the decision and RNG, which adds noise to the process. In other words, the correct decision does not always produce a good outcome, and sometimes a bad decision produces a good outcome. It would be a mistake to retroactively label a decision as “correct” simply because you got lucky. Your opponent is a mage, and on turn 6 you flood the board with a lot of small minions. If he has flamestrike, playing it deals 4 damage to each of your minions, instantly killing your whole board. Turn 7 comes and it turns out he doesn’t have flamestrike, so you win the game easily. You conclude that playing all your minions was a great idea because he didn’t have flamestrike. This logic is fallacious: it fails to separate decision from outcome. A correct action is the one that maximizes the win probability, given the information available at the time. Therefore it makes no sense to look at the outcome and retroactively judge the correctness of the initial decision. So in this example, playing all these minions was a mistake because there’s a high chance the mage has flamestrike. It doesn’t matter if he actually has flamestrike or not, the mistake is equally bad. (A better play would be to play fewer minions, thus mitigating the risk). Now here’s a real life example. Last term, I had multiple job offers for software engineering internships and I had trouble deciding which one to accept. So I tried to negotiate: I picked one of the companies, told them about my other offers, and asked for a 20% raise in salary. My request was denied. Does this mean that negotiating was a waste of time? Absolutely not. I know friends who successfully negotiated a higher salary by doing something similar. My particular outcome was not successful, but this doesn’t indicate my attempt was a mistake; if I found myself again with multiple offers, I would do the same thing. In both Hearthstone and romance, you can end up losing, even if you do everything correctly. Tennyson also realizes the need to separate the outcome (to have loved and lost) from the decision to pursue the relationship. There’s a lot more I could talk about, but this post is getting quite long so I’ll stop here. Whether you agree or disagree with my view of the world, please leave a comment!